For iPhone users who have a Google Cardboard in hand, you may come the ideal to get your favorite DVD movies played on it with immersive 3D effect. The following article will show you a simple workaround to view DVD movies on Cardboard with 3D effect. No matter what movies you wish to enjoy on Google Cardboard via iPhone, you will first need to download and install an VR video player on your iPhone. Following are the 5 best VR apps for Google Cardboard. Here, we try to use Google Cardboard’s official VR video player – Google Cardboard to view 3D movies on it. The Google Cardboard app is a large app – 74.63MB – so make sure there is enough room on your iPhone. To get DVD movies played on Google Cardboard via 3D effect, you will need to 3D Movie Converter. Here, Pavtube Video Converter Ultimate is highly recommended to you. The program can comprehensively convert DVD disc, Video_TS folder and also DVD IFO/ISO image file to Google Cardboard app view-able 3D SBS mode with either MP4 or MOV formats. To get your desired 3D video quality and effect, you can adjust the output 3D video depth value to change the 3D depth perception. As for whether selecting the full SBS 3D or half SBS 3D, if you have a VR player with more graphic power and you wish to have a better 3D video quality, just select the full 3D SBS format, if not, a half SBS would satisfy your needs. Apart from that, you can also check the “Switch Left Right” option to change the image display order for 3D SBS movie. Clicking the Format bar, from its drop-down list, choose Google Cardboard VR app supported 3D formats by following “MP4 Side-by-Side 3D Video(*.mp4)” under “3D Video” main category. You can also choose other 3D SBS formats according to your own needs. 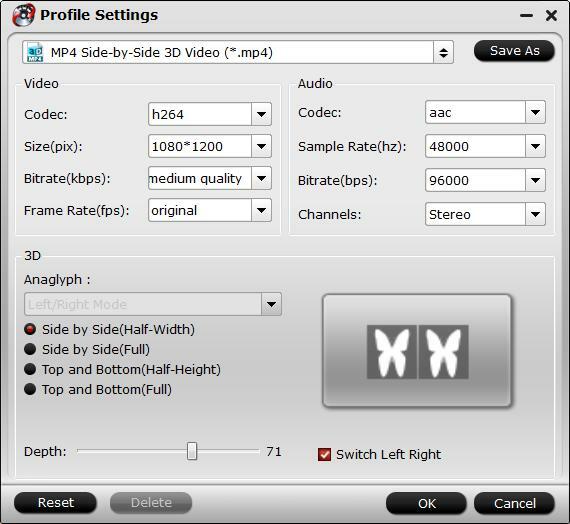 Click “Settings” on the main interface to open “Profile Settings” window, here you can adjust the 3D depth, change image display order for 3D SBS movie, you can also make a choice between full sbs and half sbs according to your own needs. Step 4: Begin the final DVD to 3D format ripping process. Go back to the main interface and start the DVD to Google Cardboard VR app supported 3D SBS MP4 conversion process by hitting right-bottom “Convert” button. When the conversion is completed, click “Open Output Folder” to pop out the folder with generated 3D SBS files. Then you can follow the steps below to watch converted 3D movies on Google Cardboard via iPhone with 3D effect. This entry was posted in Media Transfer by vina. Bookmark the permalink.